Have you ever watched closely what you are actually doing while puffing on a cigarette? If you observe, the pattern goes like- you inhale smoke which is temporarily soothing, hold your breath, and exhale the smoke again. The same habit is mimicked later during the withdrawal phase. When you first quit, you tend to take in shallow breaths. Part of this is also due to a certain amount of anxiety you may have as soon as you decide to quit smoking. But it is important to know that through shallow breathing, you are achieving the opposite of what you should do in order to stay calm and focused. Inhale deeply and let the stomach inflate. Think of something positive while doing so and then exhale slowly. Repeat this at least 10 times. You will feel a wave of relaxation travelling through your head and eyes. This exercise helps you have sufficient oxygen in your system and helps you fight the urge to smoke. Touch the upper palate with your tongue and take a deep breath through your nose while counting to 10. Hold for a second. Keep your eyes closed while doing so and then exhale slowly. It will be better if you curl your lips the way you whistle while expelling air. Control your breathing by following this pattern- hold your breath and then exhale while repeatedly saying the words of your choice (like good or calm) or murmuring anything else that relaxes you. Try sitting on a bench or just stand in an open area. Lift your arms as high as you can while taking deep breaths. It not only proves to be a good stretch for the body, but also helps you fight the urge to smoke. It is a common observation that you tend to take shallow breaths in the first few days of the nicotine withdrawal phase. 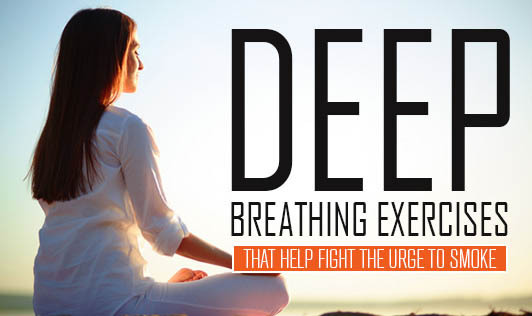 Trying deep breathing exercises can help you relax your better and beat stress too.